Fixing Grace : $30 Pre-Lit Christmas Tree Fix. 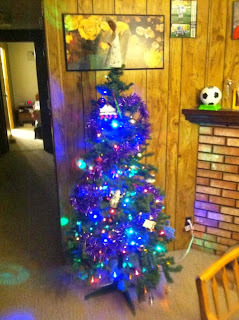 About five or six years ago, we bought a new Christmas tree with the lights already installed. This has been great because the idea of stringing lights every year was a real pain. I could just put the tree together, plug it in and it was ready to add ornaments, garlands and the obligatory angel my mother in law made before she passed away. Last Saturday, we put the tree up and I spent nearly two hours replacing bulbs because the top of the lower section inexplicably went dark. I'd change a bulb and several hours later, another bulb would go out. This was getting to be some serious humbug. Time to buy another pre lit Christmas tree, but a trip to Meijer confirmed these were picked over and the L.E.D. trees were about $100.00 (all they had were white lights). I didn't want to spend $50 on a tree that I was going to have to do this again in a short time either. The one we have, minus some needles, is fine for what we use it for and we live in a trailer. Meijer has a string of 60 L.E.D. or light emitting diode lights for $10. I bought three boxes and went to work. L.E.D. lights have the advantage of being brighter and use a lot less electricity. They'll also last for about 25 to 30 years without burning out and the bulbs are cool to the touch. The regular incandescent lights are about $3.00 a box, but within a year or two, will be back to square one. I don't have the foggiest idea how many lights you'll need for this, but three to four strands for a six foot tree should work fine. You might also want some small zip ties and a pair of wire cutters to make life easier. Make sure the power is off before you remove the old strands and keep children and pets away. Start with the bottom section first by carefully removing all the old wires from the branches. Some are held on with plastic clips, zip ties, or other methods. Pay attention to how the old wires went on because this is what makes the tree able to fold up and put away. Leave enough slack in the new wire, but no so much that it dangles and you use too much of the strand. It's helpful to have the strand plugged in while securing it to the branches, covering as much of the wire as you can. My advice is to use a few zip ties or those clips to hold the wires to the tree and once you're satisfied with the result, go ahead and secure it the rest of the way. Do the same for the top or subsequent sections, making sure you can un plug the strands between sections like it was on the old strands. This is not hard, but time consuming and it sure beats plunking down another $100 to $150 on a new L.E.D. tree. Merry Christmas and Maranatha!